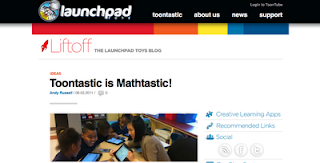 Teaching like it's 2999: Guest Blogger on LaunchPad Toys! Hi friends and visitors! I wrote a piece on Toontastic and my plans to utilize it in my class this year. It is featured on the Launchpad Toys website. Thanks to Andy Russell for featuring me on the Launchpad blog!